A Stanford-trained physician, who gave up the promise of a lucrative private practice to embrace the Native American healing arts of his ancestors, describes his continuing efforts to integrate both ancient and modern medicine. The unabridged Foreword to the book, by Andrew Weil, M.D. In Native American traditions, coyotes are survivors. Half Cherokee, Mehl-Madrona is certainly a survivor, too. Here he describes his twin journeys through the worlds of medicine and of the spirit. His medical education gave him the background he needed to practice regular medicine, but he failed to complete several residencies in internal medicine and psychiatry, for his fascination with Native American healing, which, often in long metaphorical stories, emphasizes the spiritual aspects of life, made it difficult for him to knuckle under to the bureaucratic, overly mechanical responses of modern medicine. Some of the most moving and illuminating parts of his story are those in which he describes, in detail, the sweat lodge and other Native American healing ceremonies. Several shamans, whom he depicts as personalities as well as carriers of tradition, helped teach him aspects of Native American medicine, and he finally completed his residency and wound up in Hawaii, a practitioner and teacher of both types of medicine. This book comes from a veiw that is very seldom seen in a person combining modern technology with his born heritage. He makes it seem like you are right there with him all the way through the whole experience of his life and modern practice. It is a must read for anyone who is studying Native American beleifs and culture. Having suffered from a chronic major depressive illness for what seems like forever, and finding no relief from subscription anti-depressant medications, I was starting to panic because I was losing hope in the medical treatments that were being given to me to relieve my symptoms. I had long ago given up hope of finding someone who could possibly find the cause of this depression and be able to cure it once and for all. Thanks to fate, I guess, I picked up Dr. Mehl-Madrona's book and the rest, as they say, is history. He is director of the Center for Complementary Medicine in Pittsburgh, a two-hour drive for me, which was a small price to pay for the possibility of actually getting well. Upon first meeting Dr. Mehl-Madrona, I was struck by his unassuming, unpretentious and unthreating manner, especially in light of the fact that he is intellectually gifted. He was unlike any doctor I had ever met. We mapped out a course of treatment, which was not conventional by any stretch of the imagination. But, after only a few short months of treatment, I am a different person, a whole person, thanks to Dr. Mehl-Madrona's healing methods which integrate all levels of being - physical, mental, emotional and spiritual. I literally owe my life to this wonderful doctor. He put me in control of my healing, but he was there with me every step of the way. He treated me as an equal, as a partner in the healing process and the results have been nothing less than amazing. Read this book. It is a revelation of the lack of compassionate health care that is rampant in our society today. Dr. Mehl-Madrona is a light in our world who passes that light on to his patients and readers in order for them to see clearly the medical establishment that has lost touch with what's real and what's sacred about being human. If you take away nothing else from this review, remember this. Don't give up, don't ever give up. There is hope. And he goes by the name of Lewis-Mehl Madrona, M.D. As more and more of us in the medical profesion start to learn from our ancestors; and more importantly, as we start to listen to our clients and ourselves, I have a feeling that we will hear more about this book. Maybe we will read more from the author as we let him know that he is not alone. I have no Native American blood, but every page of this book awakened fresh awareness why I feel such despair in dealing with what is called "healing" among American practitioners of medicine. I have a niece who went from terminal cancer to no traces of cancer in ONE sweat lodge and prior week of preparation with Mehl-Madrona. She was able to believe. His approaches will grate on those who value dogma and replicable rigidity over substance and intuitive responses to the individual. This book rates ten stars in my response to it. It moves toward sanity; away from the profits to be made in pushing destructive "medicinal" drugs that mask rather than cure. Essential for anybody who thinks they have a hard life. Lewis Mehl-Madrona has achieved what most of us would truely wish for - a book which entertains and enlightens. He illustrates his own story with native tales which give the reader a deeper understanding of themselves as well as the book. 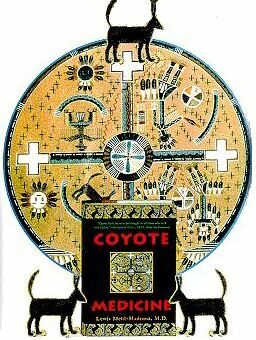 I liked 'Coyote Medicine' best because it leads the reader through all the ceremonies - giving them an insight into a previously hidden world without making it threatening, mysterious or even pompous. Despite being simply written it has a very strong and clear message - modern medicine has strayed too far from nature and become too self important. As a Native Amerian person, this was a very emotional book for me. Although it only took me a few days to finish reading the book, I cried through most of it. I could relate to what the author was experiencing and also to what his patients were experiencing. At times I felt as if he was writing about me. This book helped me realize that I am not the only Native American that is "Spiritually Lost". Hurrah! Another great book on complementary medicine. I am a registered nurse who has struggled with the reasoning behind many of our current medical practices for chronic care. Dr Mehl-Madrona's book has convinced me I am on the right path in pursuing a career that recognizes alternative therapy can serve as an adjunct to conventional medicine. Thank-you for a most enjoyable and rewarding book.